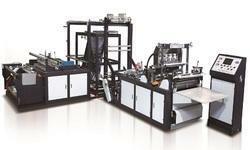 Our product range includes a wide range of non woven bag making machine and non woven carry bag making machine. This machine adopts Taiwan touch screen computer display, PLC computer program which can be edited. Auto meter counting & stopping, could freely setting number. Computer fixed-length, printing color mark track orientation, Auto-stop when complete. High voltage static processor, Auto constant temperature heating controller. his machine has the function of automatic punching. Unwinding magnetic powder tension control with manual, Auto side-correction control. This machine adopt ultrasonic welding of all aspects, bag mouth folding welding, side sealing, once full completed, fast speed, easy to operate, firm sealing, beautiful and decent. Our company is counted among the leading manufacturers, wholesalers, retailers and exporters of superior quality Non Woven Carry Bag Making Machine. These products are manufactured in compliance with the international parameters using cutting-edge technology and advanced machinery. Globally known for their hassle-free installation, simple functionality and minimum electricity consumption, offered products are widely demanded by the customers we have.